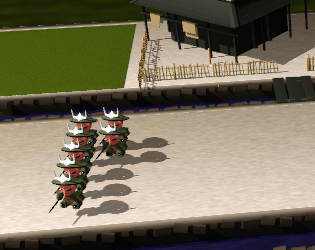 Become an emperor who controls an army of samurai warriors. Sacrifice a samurai to gain more honor, which in turn lets you train a new samurai or upgrade your weapon damage. Careful though, the bigger your army, the more enemies that will be aware of your presence at once. Sacrifice a samurai too early, and you lose the damage increase on that samurai. Even worse, if you let a samurai die without sacrificing them, you get 0 honor.